^ Rothman, Lily. "This Is the Real Jackie Interview With LIFE Magazine". Time.com. Time Magazine. Retrieved 20 January 2017. ^ Harris, Hunter. "The Real Story of the Life Magazine 'Camelot' Interview in Jackie". Vulture.com. New York Magazine. Retrieved 20 January 2017. ^ Wilkinson, Alissa. ""Politicians have always tried to sell a fairy tale": Jackie's screenwriter on the power of a well-crafted image". Vox. Retrieved 23 March 2017. ^ Stamp, Elizabeth (1 December 2016). "How a Designer Re-created Camelot for the New Movie Jackie". Architectural Digest. Retrieved 3 December 2016. ^ Setoodeh, Ramin. 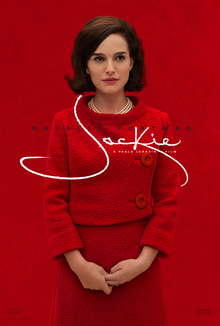 "Fox Searchlight Buys 'Jackie,' As Natalie Portman Enters the Oscars Race". Variety. Retrieved 13 September 2016.